You may have noticed, but I’ve been pulling double duty on Fiery Friday for the last few weeks. 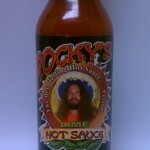 You may also have noticed that each morning review has featured a product from Rocky’s Hot Sauce, a new company out of Pennsylvania. And if you’ve been truly observant, you may have noticed that I have thoroughly enjoyed every single one of their sauces so far. As both a reviewer and a consumer, it’s really cool to find an entire line of delicious quality products. Of course, that also means there’s a lot of pressure put on the last item in the lineup. In Rocky’s case, that last item is the Lime flavor. Will it live up to the legacy of its forebears, or will we end this Rocky’s run with shame and disappointment? Remember when I said that the BAR-B-QUE sauce’s ingredients were nearly the same as the Original’s, just with a few small changes? Well, the Lime variety’s list is exactly the same as the Original’s. Of course, that doesn’t mean the actual product is the same; rather, I’m just referring to what I see on the label. Oddly enough, the word “lime” is nowhere to be found in the above list. I’m going to make the assumption that it falls under the “Natural Flavors” umbrella, but I’m still surprised that there isn’t some sort of lime juice or whatever mentioned in the ingredients. Not surprisingly, Rocky’s Lime looks pretty much the same as everything else in the lineup, to the point that most people would have a difficult time distinguishing the four flavors if the labels were removed (heck, even the labels are very similar). Also like its sister sauces, Lime is a little thick, and can take some work to get through the orifice reducer (or you can just remove the darn thing). I’m a little disappointed by the lack of a real lime scent in this. For all I know, the little green fruit is in there, but I cannot smell it for the life of me. All I get out of the scent is the same spicy smell as the Original variety. The flavor is, thankfully, a different story. Though the lime flavor is not overwhelming, it does have a noticeable impact on the overall taste. It’s still much more cayenne and Worcestershire than actual fruity flavor, but it does the trick. Honestly, I was a little worried before I tried this that it simply would not live up to the others. Especially after the phenomenal Garlic sauce, even a decent flavor would have been a disappointment. Thankfully, there is no disappointment to be had with this bottle. First of all, it’s quite spicy. As with the previous Rocky’s review, this one gets a Mean. And while I’m a little tempted to knock its flavor rating down a peg for not having a terribly strong lime flavor, it’s just so damn good that it needs a Notable. Besides, whatever lime is in there does a great job of piling on the burn, allowing this one to be just as hot as the Garlic without having that product’s heavier emphasis on extract. As with Rocky’s other sauces, the added flavor twist in the Lime isn’t so strong that it reduces the product’s versatility. My first thought is that it would go great on some poultry, especially some tequila chicken. I will definitely put this on some tamales when winter rolls around (for two or three days here in South Texas), and I also bet it would make an interesting addition to a Bloody Mary – not the main ingredient, of course, but as an added bonus for those of you who like it hot. My favorite thing about the Rocky’s lineup is that every product shows it is possible to use capsaicin extract to achieve a powerful burn without sacrificing flavor. I’ve not yet met anyone who truly enjoys the taste of an extract-centric product, and I’m glad that Rocky’s sauces do not fall into that trap.